Watch here for any changes. HOPEFULLY WE CAN GET BACK UP AND RUNNING NEXT YEAR. over the next YEAR, so Please, STAY TUNED. Click on either of these pictures for a bigger view. Nestled amongst the back drop of the Great North Woods at the northern edge of New Hampshire's White Mountains is the small town of Colebrook where the Blessing once was. This wilderness area also includes New Hampshire's most northern town, Pittsburg. Our area is blessed with some of the most spectacular scenery and down home hospitality that can be found anywhere in North America. 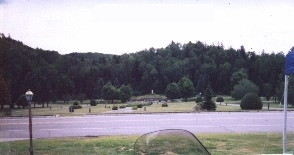 For the motorcycle enthusiast, Lancaster, Groveton, Northumberland, Colebrook, Pittsburg and the surrounding small towns, with our magnificent lakes and forests, is the ideal "Getaway Destination". The Great North Woods offers peace, tranquility, country roads, wildlife, and the opportunity for you to show your respect for Motorcycling with the Blessing of this great sport. 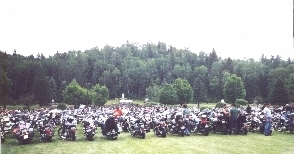 The "Annual Great North Woods Ride-in" gives the Motorcyclist a chance to relax, have fun and enjoy our spectacular region. Please join us for this wonderful and unique event. Make it your own personal getaway. This page has been visited by people from all over the world times. Click on this link, to take you to get information and pictures of The Great North Woods of New Hampshire, and many other different photographs throughout NH also. World-wide listing of motorcycle events sorted by area. Motorcycle Consumer News - web site! The web's largest directory of hand selected and personally reviewed biker links. A GREAT BIG THANK YOU, goes out to everyone, whom helped make the previous years - "Blessing Of The Bikes" and "Great North Woods Ride In" such a complete success!